The whole area is acting like the blockbuster film "The Day After Tomorrow"
Another massive quake has hit Mexico for the second time in 3 weeks, a mag 7.1 - 5km ENE of Raboso, Mexico just 11 days after a massive mag 8.2 struck the west coast which was the biggest Mexican earthquake in 100 years. According to La Times, today's quake is on the anniversary of a 1985 quake that did major damage to the capital. The extent of damage and injuries was not immediately clear, but people fled office buildings along the central Reforma Avenue. 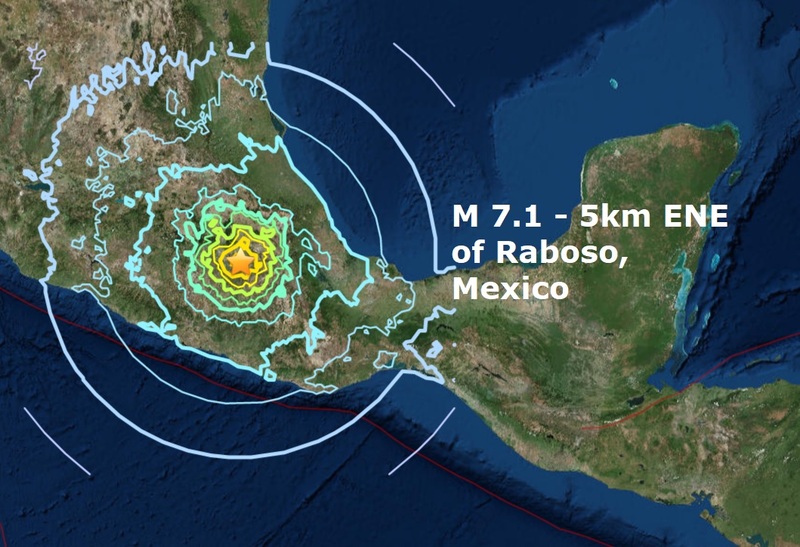 Mexico's seismological agency calculated its preliminary magnitude at 6.8 and said its centre was east of the city in the state of Puebla. The U.S. Geological Survey set the magnitude at 7.1. Update! A powerful earthquake shook buildings in Mexico City on Tuesday, on the anniversary of a 1985 quake that did major damage. The U.S. Geological Survey said the earthquake of 7.1 magnitude hit 5 miles southeast of Atencingo in the state of Puebla, at a depth of 32 miles. Buildings have been seriously damaged in the city, with local television stations broadcasting images of collapsed facades and streets filled with rubble. There are no immediate reports of casualties, according to AP. In Mexico City pictures fell from walls, objects were shaken off of flat surfaces and computer monitors toppled over. Some people dove for cover under desks. Earlier in the day buildings across the city held preparation drills on the anniversary of the 1985 quake, according to AP. Much of Mexico City is built on the former lakebed, and the soil is known to amplify the effects of earthquakes even hundreds of miles away. Reuters originally reported a magnitude 7.4 for the earthquake, citing the U.S. Geological Survey.